Because it’s extremely difficult to acquire and maintain a current email address for 100% of your customers, using a combination of email and service reminder postcards ensures that you reach as many of your customers as possible. We work hard to find email addresses for your customers so you can save the cost of sending postcards, but the reality is that you’re still likely to need a service reminder postcard to reach your full customer base. Postcards, including postcard reminders, are also a nice complement to your email marketing campaigns, giving you another opportunity to put your message in front of your customers. These eye-catching jumbo postcards ensure that your shop’s message and special brand of service will get the visibility needed to make the right impression on your customers. We’ll personalize your communications with information such as your shop hours, industry affiliations, accepted payment methods, and your personal signature – to project a professional image that is unique to your business. By combining our large postcard format and professional graphics, you’ll present your message for maximum impact. 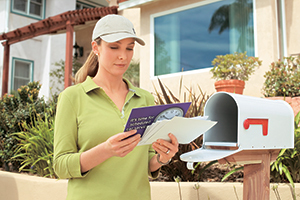 We create a personalized communication that will ensure your message won’t be perceived as junk mail. By providing the right message at just the right time, you’ll be communicating like a pro to bring your customers back to your business sooner and more frequently. Insight from your shop management database gives the SocialCRM system the ability to leverage the data you enter every day to customize customer outreach based on vehicle history. We pick the precise next service date by using the vehicle mileage and mileage driven per day to project when the next OEM scheduled service will be due. Then we can send out an auto service reminder. Target Market Postcards are perfect if you want to make a special announcement or offer a special promotion. We can sort your existing customer list or purchase a list to solicit new customers for your business. We can also combine Target Market Postcards and emails to provide the most comprehensive, cost-effective solution with the highest response rate.